When you hear Air Balancing you might have pictures of a puff of air trying to stay on a narrow bar without falling off. While that might be something you would see in the comic section, when it comes to your home, Air Balancing is a bit different and more important. The simple explanation is that the amount of air coming into the home needs to match the amount of air going out of the home. So what air is going out of your home? There is more air leaving your home than you probably realize. Items such as your furnace, water heater, clothes dryer, range hood, and bathroom exhaust fans can all be pulling air out of your home. All of these items provide a pivotal role in the overall comfort and/or indoor air quality of your home so not using them is not an option. This is where the balancing comes in. As we defined earlier, balancing is making sure the amount of air going out matches the amount coming in. So where do we get the air (referred to as make-up air) to balance everything? This all depends on the construction of you home. Many older homes have what is called natural air infiltration. The rest of the world knows these as drafts. In newer homes, the amount of drafts has been greatly reduced. You might hear the term – tight home. While this helps with the comfort and efficiency of the home it creates an issue with the air balance of the home and it is harder to account for all the air leaving the home. An easy way to balance the air is to leave a door or window open. That works great unless you live in a climate that has temperature changes (like almost all of the United States). There might be a few weeks of the year that this would be a viable option but in the middle of summer in Arizona or the middle of winter in Minnesota, not sure you want to have a window open. This is where mechanical solutions come in. A mechanical solution like the Air King QFAM is set up to bring fresh, filtered air into the home – balancing the amount of air leaving the home. There are air test that can be done to your home to determine how much air is leaving, then the QFAM can be set to deliver the proper amount of air flow to make-up that air providing a safe living environment. Wait, you used the phrase “safe living environment” does that mean mine is not? Maybe. 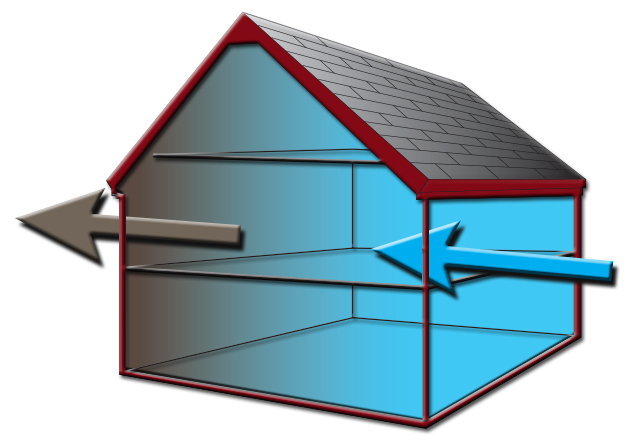 If a home is too tight and the air leaving is not replaced, you can create a negative pressure inside your home. Air will always find a way to balance itself and can start pulling from things like furnace vents or chimneys. The negative pressure won’t allow them to vent properly and the harmful fumes, gases and contaminates that should be going out of the home could be coming back into the living environment. For these reasons the American Society of Heating, Refrigerating and Air Conditioning Engineers (ASHRAE), who is a leader in writing codes for indoor air quality standards has included a provision for fresh air (or make-up) air in the latest version of ASHRAE 62.2. Balancing your home’s air is an important element to your indoor air quality and healthy living. For more simple and effective was to accomplish balanced air, visit the Air King website at www.airkinglimited.com.